Update: Hurray. Gov. Malloy has come out against this particular tax. Yes, literally. A bill pending in the Connecticut General Assembly would impose a tax on generators of electricity that use coal, oil and nuclear power. Of the $340 million the tax is expected to raise, $330 million would come from the company that owns Millstone, the state’s only remaining nuclear plant. That’s right. This amounts to a special tax on one company and one form of energy (it should be noted that Gov. Malloy’s proposed tax on the plant sought to raise only $33 million, fully one-tenth of the amount that would be raised if this bill passes). Dominion spokesman [Ken] Holt said Millstone directly employs 1,080 people and 350 supplemental personnel. 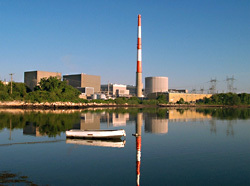 The facility is responsible for roughly $1.2 billion annually in economic benefits to Connecticut. Now it’s entirely possible, as Rep. Vickie Nardello (D-Prospect) suggested, that Dominion is merely employing a “fear tactic.” Still, think for a moment what kind of message this confiscatory tax would send to businesses that might want to relocate to Connecticut. Sure, natural gas and other kinds of electricity generation would be exempt from the tax, for the time being. But how long would it take before grasping lawmakers started eying the treasuries of companies that produce other forms of energy? Would you want to locate a business, any kind of business, in a state that has this kind of arbitrary tax policy? Perhaps Rep. Nardello, who chairs the Energy and Technology Committee, might want to consider that before bringing the bill to a vote. Nardello, you might recall, advocated strongly last year for an energy bill that called for the state to create at least 25 megawatts of wind power. But now that an energy company has proposed to put two industrial wind turbines in her own town, Nardello says she supports legislation calling for the state to enact regulations on those devices, despite the fact that the Connecticut Siting Council, which already regulates the placement of wind turbines, has said the legislation isn’t necessary. Is the committee playing “bad cop,” so the company will “happily” accept the governor’s alternative proposal? Or is Nardello simply on a crusade to revert us back to a simpler time when we all just burned wood and candles? Oh wait, there’s a bill to ban that too.